At EICMA 2011 Domino introduces a new grip specific for off-road bikes. This new grip has been developed in cooperation with the main cross and enduro Teams and it is produced by using a highly advanced mix of thermoplastic materials. It stands out for its extraordinary softness assuring a very high ergonomic and comfortable hand grip. The central part of the grip has a “barrel” profile to get the best hand grip under all the race conditions. On the flange there is also a new-concept pad made of a softer material to allow a comfortable hand grip and the fingers rest on the flange while riding. For competition, it is provided with 3 seats for the safety fastening iron wire. 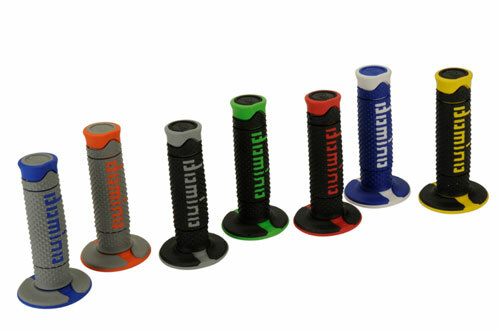 The grip is 120 mm long and suitable for Domino off-road throttle controls.